I can’t believe we’re half-way through November. The end of this year is speeding by. I picked up a few new books this week. 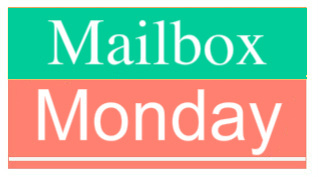 To check out everyone’s additions and add you own link, head to the Mailbox Monday Blog. My in-laws got me The Sleeper and the Spindle for my birthday. It was the closest kingdom to the queen’s, as the crow flies, but not even the crows flew it. You may think you know this story. There’s a young queen, about to be married. There are some good, brave, hardy dwarfs; a castle, shrouded in thorns; and a princess, cursed by a witch, so rumor has it, to sleep forever. I purchased a couple of Christmas mysteries on audio. Holed up at Hilary Bill-Tasman's manor estate for Christmas, Troy Alleyn is to paint the man's portrait and, while she's there, view the Druid Christmas pageant. Along with a pack of eccentric guests, Troy enjoys the festivities-- until one of the pageant's players mysteriously disappears into the snowy night. Did the hired help-- each a paroled murderer from the nearby prison-- have a deadly hand in this Christmas conundrum? Inspector Roderick Alleyn arrives to join his wife in finding the lost man-- and unraveling the glaring truth from the glittering tinsel. High school geometry teacher, Donna Russell likes her life well-ordered and logical, even if it is a tad solitary at times. But when a charming co-worker at the local food bank disappears just before Christmas, Donna is left with more questions than solutions. After the missing man's neighbor, muscle-bound EMT Sam Holton, volunteers as Donna's crime-fighting sidekick, sparks fly between them. Donna wonders if Sam can be trusted, or if he's trying to throw an unknown into her calculations - and her life. And this was a Kindle freebie when I picked it up. Francie excels at her job as a party planner, but can't say the same about love. When an obnoxious, but handsome, man approaches her in line at a Thanksgiving sale, she pushes him away like she always does. Can Francie put her fears aside and nab an early bird special, or is she destined to plan every wedding but her own? Any new reads arrive at your house this week? Happy Birthday Carol! I hope you have a fantastic day! Happy Birthday! Have a bookish birthday. The Sleeper and the Spindle by Neil Gaiman sounds like something I want to read after reading some of his short stories lately. Thanks!! I put the Gaiman one on my wish list as soon as I knew it existed. The illustrations are pretty awesome too. Don’t you just love book gifts? Again…Happy Birthday! It looks like your in laws know you well. I hope you’re having a wonderful birthday! I read the Gaiman book a yesterday and really loved it! It’s super simple, but it’s definitely a good re-telling. Happy Birthday! The Sleeper and the Spindle looks excellent. Happy reading and happy birthday! I really want to read The Sleeper and the Spindle, it looks very interesting and I love Neil Gaiman. Hope you enjoy it and your other books!